Happy Friday friends! We are so thrilled to have Kristin Funstun here with us today! She is an incredible writer and speaker and she’s bringing us some really beautiful words of encouragement that will resonate with all of us on one level or another. 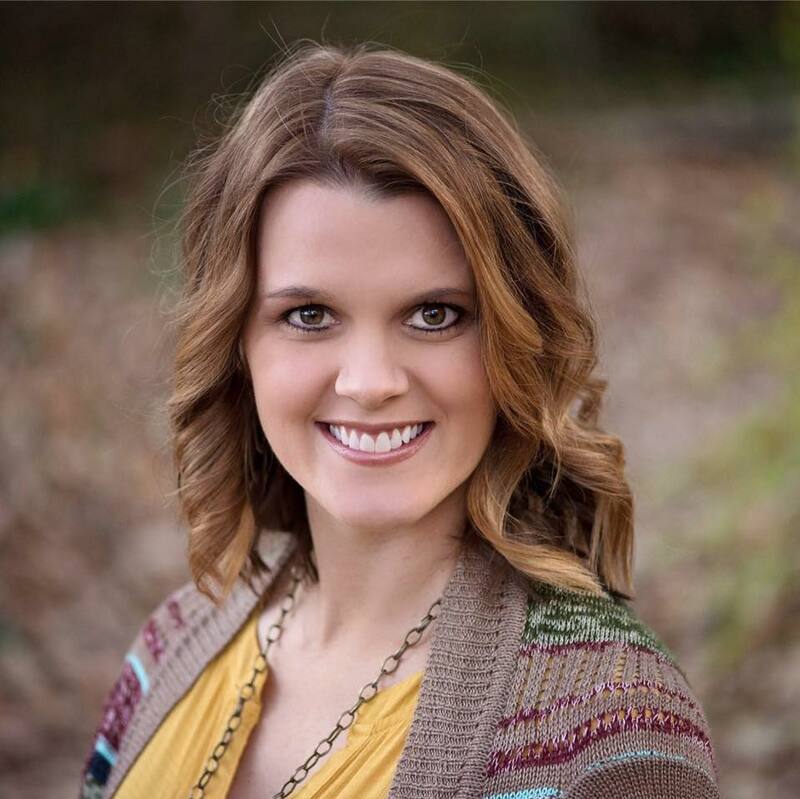 So help us welcome Kristin to the picket fence! Yes. This. Everything about the above verse makes me want to type in all the praise hand emojis. Because quiet, alone, unseen, rewards, secret … all these words tug at my busy-mom-of-three emotions. Even if I wake earlier than usual, odds are one of the children will wake up and interrupt me. They will need breakfast or help going potty or help finding their favorite shirt or something. That’s how it is. This is my reality in this season. So yes, many of us have very, very little time to ourselves right now. I’ve included below a few captured “quiet times” of my own so you can see what I’m talking about. I used to think because of this lack of privacy and silence, my quiet time wasn’t meaningful or productive, so often I’d grow frustrated and even resentful for not getting “ideal” time with God. But I’ve learned – am learning – that God can and will use my not-so-quiet moments to grow my knowledge and relationship with Him. No matter how hard I try, some days my “quiet” times are going to be filled with doll babies, nursing real babies and feeding eggos to older babies. All with Peppa Pig blasting through speakers. But I know God is with me wherever I am, whatever I’m doing and no matter who is around me. While I still crave and love the literal “quiet” times I get with Jesus, I’m learning to roll with it and recognize not every moment with God has to be perfect and serene, with all the spiritual type of feels. Because REAL LIFE, friends. 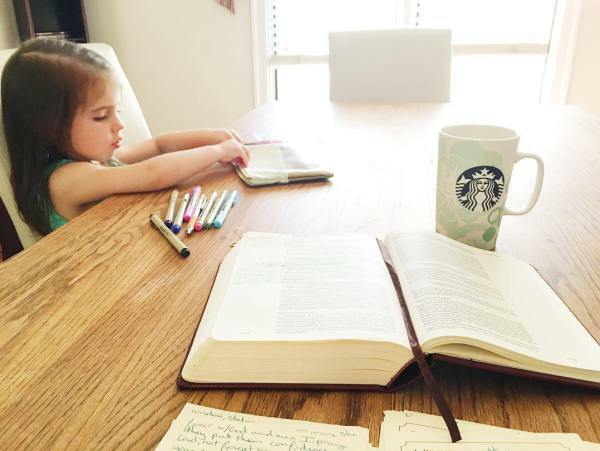 So how do you have a productive quiet time in a not-so-quiet scenario? 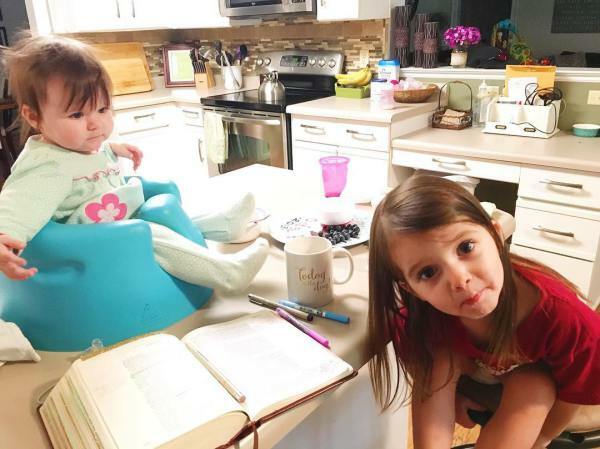 Here 4 things that help me have meaningful Not-So-Quiet Time. This is number one for me. Keeping scripture quotes, bibles, devotionals, even prayer prompts handy is great for when I do find a few silent moments throughout the day. If His Word is right there, it’s easy to take advantage of the time that does pop up. I keep my phone close by me almost all day long (I know, I have a problem), so it’s easy to hop on a Bible app (YouVersion and the First 5 app are great for quick and short reading) or listen to an audio Bible. Okay, so we’re going to devote time to God, but we don’t know how it’s going to turn out, if we’ll be interrupted or sidetracked. Plan to not follow the plan. Let’s be real. It isn’t always going to play out how we imagine it. So if you are currently trying to read through a bible study book, and you’ve been unable to sit down that day to read it, you’re going to have to engage a new tactic for the day. Sometimes, I will go back to the First 5 app or something similar, where there is a ready-made and short devotional quickly available that I am not currently following. Here are another couple strategies I use as a back-up plan (adapted from [re]SOURCE, by my good friend and pastor, Jessica H. Morris). [re]THINK – Reflect on what you learned or read in your last quiet time. Re-ask some questions to yourself about the subject and ask yourself what stands out most to you about it, that applies to you most personally. A good strategy here is memorizing scripture, as well. Take a scripture verse and meditate on it all day, write it down in an email to yourself, chant it over and over, write it on sticky notes posted all over your house, or whatever you need to do to keep thinking about God’s Word. Here, the goal is to re-engage your brain to meditate on scripture or what God is telling you. [re]PRAY – Pray a prayer familiar to you. Maybe you re-pray what you prayed about yesterday, because it’s still relevant. Or you pray the Lord’s Prayer. Maybe you speak to God through a Psalm of Thanksgiving or Psalm 23, both effective and familiar to many. The goal is simply to speak to God. Speak to him while you drive, while you shower, while you climb each stair in your home. But to simplify it and keep persistency, pray what you’ve heard or prayed before. 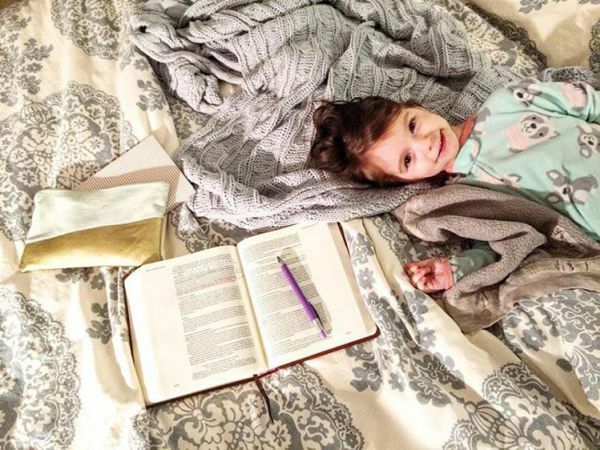 Okay, so you’ve woken up early, settled in for some QT with Jesus, and your little one sneaks downstairs. This is often an “UGH” moment for me. But I have to force myself to remember it doesn’t have to be, nor does it for you. We can pull them up next to us and read out loud, pray out loud, or explain to them what God is teaching us. Remember in Mark 1:35-27 when Simon exclaimed to Jesus during His quiet time, “everyone is looking for you”? Well, do you also remember how Jesus responded? Let’s take a page out of Jesus’ book, and when people are looking for us, let’s teach them and pray for and with them. Jesus reminds me our people should be inclusions, not interruptions. Because this is why we are here. So there you have it. These are some of my tricks for meeting with Jesus during a non-quiet or restful season of life. Thank you so much Kristin for these wonderful words of encouragement today! If you want to hear more from Kristin, you can follow her on Facebook, Instagram and Twitter. 6 Comments on "When Your Quiet Time Isn’t So Quiet"
Thank you, Angie! And yes – we live in a not-so-quiet world! Love these ideas, Melanie!! 🙂 I have childrens’ bibles for them, so I can attest to that suggestion! Thanks for weighing in! Praying for you, your circumstances and even perspective! You are correct, God is good and He will prevail!